I spent my childhood in the Midwestern suburbs where there were no mountains to climb or wild expanses to explore. The land was so flat and developed that the county landfill was our tallest local peak and, consequently, our sole sledding destination in winter. So I grew up without any sense of the great outdoors. When I decided to go camping for the first time in my life in April of 2005, I had no clue what I was doing. I did know that I needed gear. I went to a big box sporting goods store and, on five minutes of consultation with the on-staff teenager, bought some rudimentary supplies and dried packaged foods. I then threw everything in my trunk and headed out to Joshua Tree National Park. I did not arrive at the park until well after nightfall. I lacked the foresight to bring a headlamp or flashlight, so I scurried around in the dark to set up my tent. (I didn't use my car headlights to avoid disturbing my fellow campers). I also did not think to first survey a campsite before setting my tent. Instead, I pitched the tent exactly where it landed when I tossed it from my trunk. 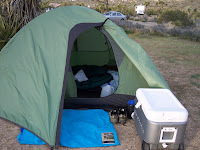 Unfortunately for me, I did not notice that my tent had landed on top of a giant ant hole. When I woke up the next morning, I saw a swarm of ants crawling on the walls of my tent -- fiery-red ants that were big enough to be seen from a distance. From what I could tell, they were angry. I swear I could see them looking at me, mashing their mandibles in a menacing way. If they could curl their forefeet into fists, I'm sure they would have been shaking them at me. 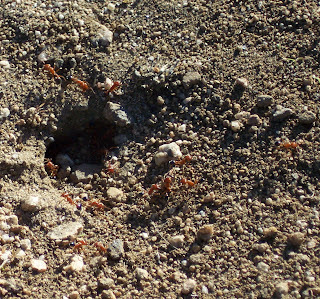 Perhaps a troop of ants might seem like a small worry for most people, but for me, it is a traumatic event. I HATE ants. I fear them unnecessarily. I'm not sure what I think they will do to me, but my knees literally buckle and I shriek whenever I come across an ant hill in the sidewalk. If I see a line of ants in my kitchen, I spend the next hour cowering under my bedcovers. So, for me, waking up to a few hundred fiery-red ants starting down at me through my tent walls caused momentary paralysis. Lying frozen in my sleeping bag, I thought of how the citizens of Troy must have felt waiting for the Greeks to sack their city. It felt like hours before I was able to will myself to leave my tent. And even then, I owed that motivation more to my desperate bladder than any shred of bravery. I completely relate to this story. I will become ENRAGED at the mere sight of ants. I don't know what it is about them, but I go into a blind rage - usually screaming, jumping and stomping them out.